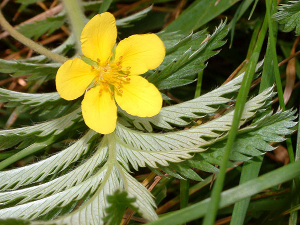 Observation - Silverweed - UK and Ireland. Description: Large quantities of Silverweed spreading amongst the grasses and reeds across the site. The silver underside of the leaves make the plant highly noticeable when blown in the wind. Large quantities of Silverweed spreading amongst the grasses and reeds across the site. The silver underside of the leaves make the plant highly noticeable when blown in the wind.